Home - Canterbury Animal Hospital is a brand new, state-of-the-art, full service companion animal hospital. 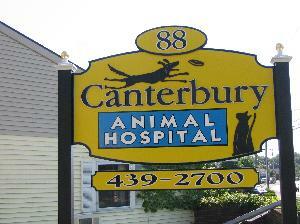 Welcome to Canterbury Animal Hospital's website! Canterbury Animal Hospital is a brand new, state-of-the-art, full service companion animal hospital located in the Albany suburb of Delmar, NY. We are committed to providing quality veterinary medical, dental, diagnostic and surgical care throughout the life of your pet. We are dedicated to being a partner in your pet's health. We hope you have fun exploring our website. Thank you for taking the time to read about our veterinary practice and the services we offer. We welcome your comments and suggestions. Please contact us at (518)439-2700 for all your pet health care needs. Click here to learn more about our new therapeutic laser and how it can help your pet!